Series of portrait busts “New Age Demanded” by Jon Rafman reference poem “Hugh Selwyn Mauberly” by Ezra Pound, which tells of a poet who tries to survive with his art in an age of ignorance. “New Age Demanded” tries to send a strong message regarding the role of the artist, who in each era is called upon to offer something new, powerful and desperate. The artist, according to Rafman, has to represent the impossible: the true character of an epoch, but also its inevitable decline. The busts of the series in fact have a particular relationship with time and form. They capture the accelerated movement of an instant and freeze it, as if in the middle of its transformation. The “no’s” repeated along the lines of Pound’s poem explain how the impossible can be expressed by negating certain aspects of the present. In the same way, Rafam’s sculptures are negations in and of themselves: they represent neither man nor animal nor machine nor object. They are without a face and at the same time monumental. They evoke both the classical image of the Greek bust as well as a mutating universe of science fiction that anticipates the imaginative worlds of the future in which nature mingles with hyper-technology. An image in which present, past and future weave together and clash, projecting us into a new age made of great expectations. Good to see new pieces from the New Age Demanded series by Jon Rafman. 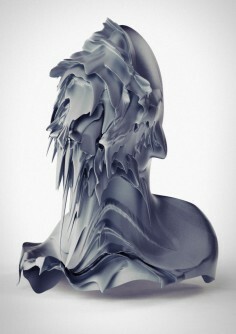 “Inspired by classical Greek busts, Jon Rafman uses computer software to digitally render three-dimensional forms. The forms act as the structural surface on which two-dimensional Internet-sourced images are applied. The series is presented as large-scale archival pigment digital prints. Each print is created with its own speciﬁc texture and sculptural mutation. Rafman uses historically recognizable works from canonized artists like Mark Rothko, Georgia O’Keeffe, Piet Mondrian, and Wassily Kandinsky as the subjects of his appropriations.” – Stefan Hancherow. Jon Rafman is an artist and filmmaker whose work examines the effects of contemporary technology, particularly on interpersonal relationships. Recent solo exhibitions include The Nine Eyes of Google Streetview at the Saatchi Gallery, London, Remember Carthage, New Online Art at the New Museum, NY and also at Palais de Tokyo, Paris and Mirror Sites, International Art Object Galleries, Los Angeles. Group shows include Speculations on Anonymous Materials at Fridericianum, Kassel; The Photographer’s Gallery, London; Nine Eyes as part of the Moscow Photobienniale, 2012; Screenshots at William Benton Museum of Art, Connecticut; The Greater Cloud, Netherlands Media Art Institute, Amsterdam and From Here On, Les Rencontres d’Arles: International Photography Festival, Arles. Artist Jon Rafman uses software to digitally render sculptures and then applies Internet-sourced images to them. The works of many recognizable artists are re-appropriated in this on-going series of work, entitled “New Age Demanded”.